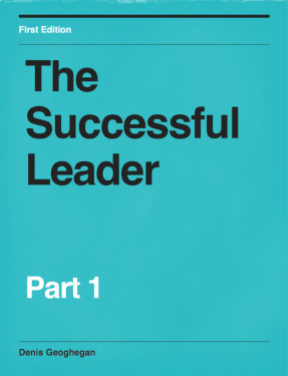 Action Centered Leadership is a model developed by John Adair in the 1960’s. The model is a simple template which can be used to guide us in the management and leadership of any team. Action Centred Leadership is sometimes referred to as The 3 Circles Model. Adair’s Action Centred Leadership model comprises of three elements which are represented as three overlapping circles. Managing the group which make up the team. Managing individuals which make up the team. 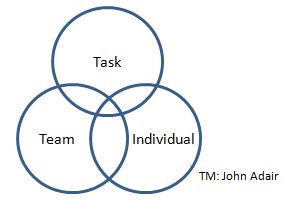 The overlapping circles show that these three elements can overlap, that elements of managing individuals will overlap with managing the group, that elements of managing the group will overlap with achieving tasks, and that elements of achieving tasks will overlap with managing individuals. One of the key strengths of the Action Centred Leadership model is that it is simple and therefore easy to remember. The model proposes that to be a good manager or leader you must have command of, and make use of, all three aspects of the model. Obviously as the model is so simple you will need to adapt it as necessary to you own situation – perhaps putting more effort and time into team management than the management of individuals, for example. An important point about the model is that it anyone can use it regardless of the position within an organization. The model becomes simple to use once you realize that Adair provided a list of the things managers and leaders must do for each of the three core management elements. Define the task – determine the vision and direction of the group. Identify the resources (people, process, and tools) to achieve the task. Create a plan – measurements, timescales, deadlines, tactics etc.. Establish roles and responsibilities within the team. Delegate work to team members. Set the standards the team must meet: reporting deadlines, quality expected etc. Monitor, control, and maintain the overall performance against the plan. Report on the progress the team is making towards it’s objective. Assess and then recalibrate the plan and targets as necessary. Establish and communicate the standards for both behaviour and performance. Establish key soft area aspirations for the group: style, culture, ethics, etc. Maintain discipline and the focus on objectives. Watch for and then facilitate resolution of conflicts within the group. Additionally, you will need to watch for conflicts between the group and external parties. Monitor the overall balance of the group. Fix gaps in the mix where appropriate. Develop morale, team working, cooperation, and the team’s spirit. Build a common sense of purpose. Provide training to the group as appropriate. Build the maturity and capability of the group by slowly but steadily increasing authority and freedom. Discuss and communicate with the group as this happens. Identify and develop roles within the group. Develop communications both within the group and externally to be appropriate, timely, and effective. Engage with the group to give feedback to them and receive feedback from them. Aim to understand the people who make up your team. Understand their personal situations, ambitions, strengths, weaknesses. You may want to use a Myers-Briggs Type Indicator or Belbin Team Roles to speed this up. Be sensitive to personal issues. Agree and communicate an individuals level of responsibility, what they are accountable for, and their targets. Give recognition and praise to individuals. Do this liberally. Reward individuals: a financial reward, increased status, or increased responsibility. Work with individuals to plan how to develop their maturity and capability, through training, increased authority, increased responsibility etc. Managers and leaders have many demands on their time. You can think of Action Centred Leadership as being a compass to help you determine where and how to spend your time so you can build a high-performance team, which delivers the right things in with the right behaviours. The Action Centred Leadership model can be applied at all levels, from CEO through program managers and project managers, and on to team leaders.